Aw, what the hell. Screw my anxieties, I'm uploading this. couldn't quite place the type, it is a very nice mix of styles, and pleasant to listen to. to harsh sounds, just a continuous fluctuating melody, kudos to you, those are hard to make, especially if you try and make the entire thing flow smoothly. Of course you know you have to make more now. Also, a ten hour version of this, demand. Ten hour!?!?! We *need* an infinite loop, ASAP! it reminds me of background music for an rpg or even a cartoon/anime where they might be standing around discussing stuff or being detective-y. Just serves as a reminder of how silly those anxieties are! This is a pretty good piece. I'm no music-guy, but it's definitely not awful~. It has a very retro SNES kinda feel to it, which makes a huge nerd like me feel right at home. I KNEW IT! She was secretly an android! This sounds actually good! Really, the pacing is very good, the mood is consistent, it all fits together and it fits for quite a lot fo scenes while still having character. Ok, I have been listening to this music for three hours straight and I still like it. I fact I even think about using it as background music in some (noncommercial) games I am building, with your permission. Hmm. I'm not sure. I ttthink it'd be okay, as long as you acknowledge that all the rights ultimately belong to me, legally, and credit me somewhere. Of course I give you credit. I might also include some easter eggs that reference your works. Come to think of it, I could try to turn Partners into a game. Given that I use RPGMaker VX I would have to simplify a bit, and it would take a while to make the sprites and textures (already have two projects for humbird and vavacung running, and I am currently studying so I have no time as it is), but it could definitely be made. Would be a bit a Final Fantasy clone but I found skripts for sideview battles, stealth and hiding, and for evolving weapons (for Natalie's equipment), so I could actually include most things. Speaking of Music, which program do you currently use? Still Anvil Studio or something else? And how difficult is it to learn for beginners? I use Music Studio, from the App Store. It requires you have an iPhone/iPad, but it's one of the most intuitive programs I've ever used. Wow, this is better than most of the music I've tried making as of late. I need to relearn keyboard and guitar, haven't played in about 1-2 YEARS! Great job dude, if you make more, don't be shy or anxious about putting it up, regardless of whether it's bad or not, it shows willingness to experiment and trial and error, both of which I know you have experience with. You know, after listening to this about 3 times in a row, I've decided something. That's pretty exciting! I love arrangements. And good thematic variation, too! That's pretty exciting! I ‌love arrangements. And good thematic variation, too! Awwww, yeah, man! I've been waiting for more music from you! I still have your old stuff on my iPhone! Hmmm, this is deeper, more melodic, contemplative than your earlier, frenetic stuff. Reminds me a bit of Cave Story music, too. Honestly, this reminds me, of all things, Star Control 2: The Ur-Quan Masters. 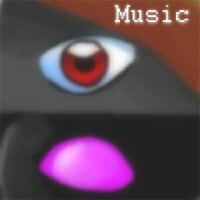 Then again, all of the music in that game was handled via MOD files; I know because a friend of mine sat down and decompiled the entire soundtrack and sent it to me and a few other friends as just the MOD files, themselves, and I even got on the phone with one of the original writers and spoke to him about the music. At the start of the track, you're drawn into a world of black and white. You're on the beat, seeing what's going on, getting a feel for the vibe on the streets. Pushing through a crowd of monochrome people, at 20 seconds, you see it out of the corner of your eye. A back alley, someone lying a pool of blood. You're the first one on the scene, the body's still warm. Footprints, a knife wound, their eyes stare eternally towards the sky. Questions, Who, When, How, but most of all, Why? If you poke around a bit, maybe this stiff can answer a few. You make a phone call and order a cup of something strong. This is going to be a long day. Just what was running through my mind while I was listening XD.